First of all it is important to differentiate between using an Outlook.com email account (like john-doe@outlook.com) and using the Outlook.com email interface to handle other email accounts (like sending & receiving emails through the Outlook.com web interface, for john-doe@my-business.com). – your Outlook.com email account being verified or not (you can get your Outlook.com account verified here – you have to login to your Outlook.com account to access the verification page). Microsoft doesn’t offer any method to actually see your exact Outlook.com reputation, but – if the above conditions are met – you will be allowed to send maximum 300 emails per day (and no more than 100 recipients per message), through your Outlook.com email account. It doesn’t really sound much, but it’s close enough to the Google Gmail limit of 500 recipients per day, considering that a 300 or 500 daily limit is anyway a serious barrier for a solid mailing list. 1. You can upgrade your Outlook.com account to a paid subscription (here is the signup page). Although Microsoft does NOT clearly state how much it will increase your daily email send limit, they do advertise that your daily limit will be increased. 2. 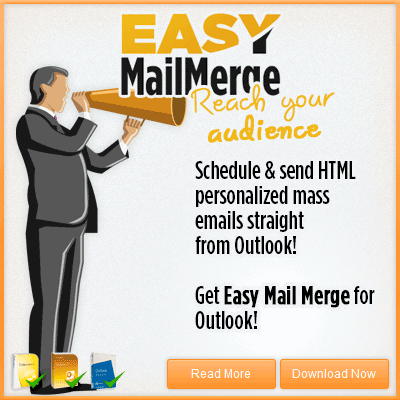 You can use a mass email software (like Easy Mail Merge for Outlook) that allows you to schedule mass emails over periods of time, so you can bypass such daily email limitations by splitting your outgoing emails in chunks that don’t exceed the Outlook.com daily email send limit. Please note that, if you are actually looking to forward emails between accounts, Outlook.com lets you define automatic forward rules – messages forwarded through such rules are NOT counted in your daily email send limit! If you added your existing email account(s) to an Outlook.com profile, the email daily send limit does not depend on outlook.com, but on the SMTP server provider of your actual email account provider. So you have to check with your mail server provider (usually your web site hosting provider or your web mail provider for free email accounts like Yahoo Mail) about their daily limit to send emails. For example, if you add a @Gmail account to your Outlook.com mailbox, your daily max email limit will be 500 (the limit enforced by Gmail) and not 300 (the Outlook.com daily send limit for email addresses @outlook.com). Outlook.com Ad-Free no longer increases the email send limit per day. Thank you for the update. Indeed, the increase in the email send limit is no longer displayed by Microsoft as a benefit for Ad-Free accounts… I’m not sure if they decided to scrap it or they simply decided it’s no longer relevant.